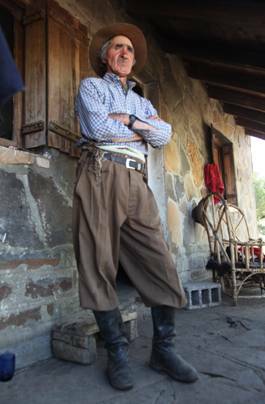 A trip to Argentina would not be complete without experiencing true, authentic Gaucho culture. It’s no secret that one of the most iconic figures in Argentine culture is that of the gaucho. Far beyond the street fairs of Buenos Aires, Gaucho culture exists deeply embedded in Southern Argentina. The term “gaucho” refers to the traditional cowboys from this region. They are often in traditional clothing and make their living by working on ranches and overseeing the horses, sheep and cattle. Gauchos and horse life are deeply ingrained in just about every aspect of Argentine culture. Their way of life has existed, often unchanged, for more than 300 years. They continue to live simply and work the land with horses, cattle, and beloved mate in hand. Experiencing how gauchos live offers a rich cultural experience that will add something special to any visit to Argentina. With over a dozen gauchos living on Estancia Ranquilco property, we truly feel at home with these incredible “cowboys” of the South. 1) Eat together. Eating is an important part of any culture and gauchos are no different. Occasionally we will have dinners together, over an asado (grilled meat - often goat or lamb) served with fresh bread or tortas fritas (fry bread). For lunches, we might have a simple picnic of meat, cheese, fruit, and fresh bread cut on stones with gaucho knives. 2) Drink Mate. Mate is one of the quintessential parts of gaucho life. You can expect to drink a lot of mate from morning through afternoon. One mate gourd is typically shared between multiple people, as a way of offering a time to bond and talk over a warm and invigorating drink. Even if you don’t speak Spanish, you will feel connected to the gauchos after sharing a cup of mate together. On a hot day, mate might even be enjoyed cool with some simple syrup and fresh herbs. 3) Horses. Gauchos are known for their horsemanship, and their horses are renowned for being sure footed and strong. The Ranquilco horses are experienced horses, most of whom have been brought from gauchos, or trained by our cowboys. Make the most of your trip to Argentina by getting to know this gaucho culture, the way gauchos live it themselves. Don’t expect fuss and frills, but do expect fun company and a warm welcome.